Art of Tao LaBossiere specializes in transforming architecture through large-scale trompe l'oeil painting. We also make sculptures, illustrations and hand-crafted mixed media artwork from 300-year old wood. We're always creating. Take a look around here and also check out our Facebook page for lots of artwork and arts-related community building. 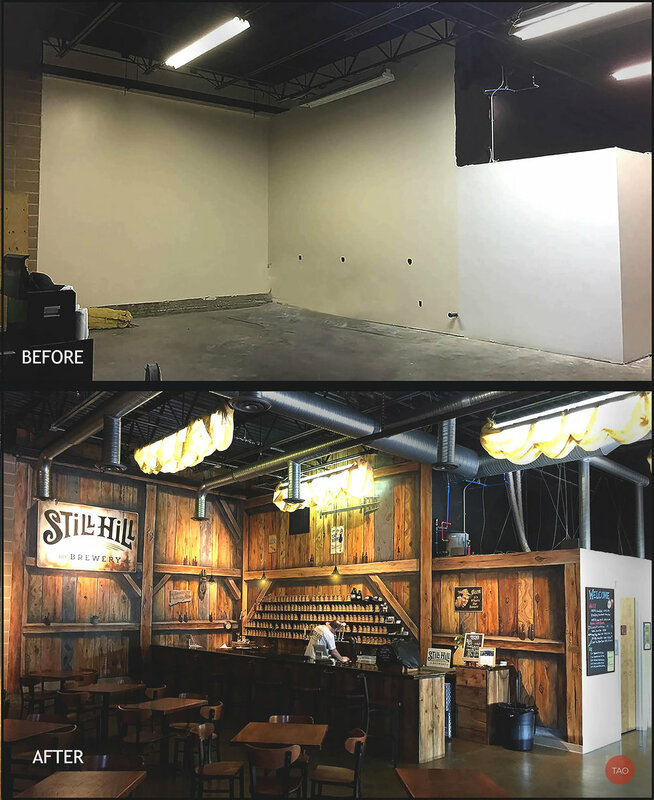 Art of Tao LaBossiere converted a plain white-walled warehouse with the thrill of trompe l'oeil painting into the look of an old barn. The project took 2.5 months to execute on site at Still Hill. Tao LaBossiere worked with some help from two mural assistants, Dwight Teal, Jr. and Julie Pereira. Inspired by a logo created by graphic designer Gary Holmes, Tao's iconic design thrilled the brewery owners and they approved the creation of this large scale indoor mural. Here's how we transform spaces. See video below for the "making of..."
" We are so proud to have Tao's original art in our tap room. The mural has turned what would have been boring industrial space into a comfortable, welcoming environment. There isn't a day that goes by that a tap room patron doesn't tell us how awesome the mural is! They are even more amazed when we tell them the story behind it and how it was hand painted by Tao. We hired Tao to simply paint our logo on the wall. His professional proposal opened our eyes to an amazing opportunity. He created a mural that has transformed our space. He completed his work on schedule and even went 3 steps further by completing a lighting project that would not have come out half as good if we did it on our own. Always helpful and pleasant we can't thank Tao and Amy enough. We welcome you to our taproom to check out his beautiful work. "